Tourists at the Summer Palace in Beijing on May 25, 2013. China has seen tourism numbers drop year on year in the first half of the year as more Chinese vacation abroad and the country greets fewer foreign visitors. Recent news stories and industry studies show that fewer international visitors are choosing China as their destination. January-June arrivals in Beijing are down 15% from the same period in 2012 and more Chinese than ever before are spending their money to travel abroad, “opting out” rather than exploring their vast and varied home country. All this prompted us to ask today’s question of a handful of thinkers deeply involved in travel and looking at travel. Leah Thompson: I’ve posed for photographs in front of the Eiffel Tower, walked the Great Wall with thousands of tourists, and even reluctantly sat through a carriage ride in Central Park—but most of my tourism is of the off-the-beaten-track variety, a kind of travel completely discouraged by the Chinese government. Even deep in rural China, where you might expect to find a unique experience, the UNESCO heritage village of Hongcun, in East China's Anhui province, feels less alive than it does like Disneyland featuring massive tour bus parking lots, ticketed entry gates and row upon row of souvenir stands. Even as China’s growing cities continue to bulldoze traditional houses and neighborhoods to make room for skyscrapers at record speed, parts of the government have developed a deep appreciation for the role cultural heritage can play in forming national identity and boosting tourism and GDP. During the 1990s, the development of domestic tourism became a major government objective and led to the buildup of select destinations. 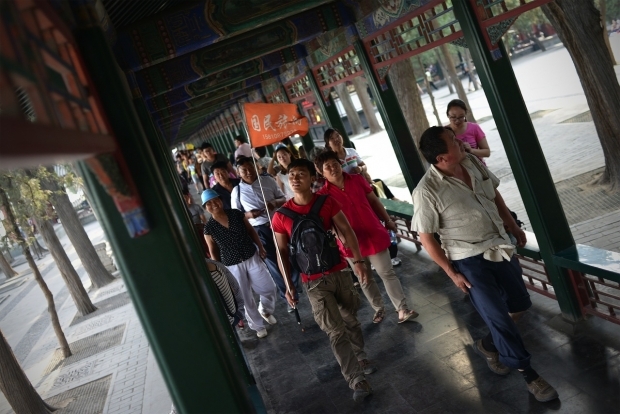 The majority of Chinese domestic tourism involves large groups, often wearing matching caps and following a guide with a flag, visiting designated “Scenic Spots.” Today, cultural heritage tourism remains a priority both at the national and local levels because it propagates the central government’s preferred historical narrative while serving as a source for local economic development. By promoting sites such as Hongcun or the Confucius Temple in Qufu, the current Chinese government aligns itself with China’s ancient past and gains authority as the legitimate protector of an unbroken 5,000-year-old Chinese civilization. If China wants to attract more foreign tourists it needs to find ways to accommodate active travel and individualized experiences. It would seem some boutique inns and travel companies are beginning to understand the increasing desire among both foreign and domestic tourists to experience something authentic. The first step in this direction requires cleaning up the environment. As China’s pollution is at crisis levels, it’s worth reiterating that all tourism suffers if the air is too smoggy see anything from a scenic spot. Damien Ma: Here are my top five, back-of-the-envelope ideas for further encouraging Chinese tourism to “developed countries,” particularly the United States. Some already are happening, and others are more far-fetched and deliberately tongue-in-cheek. But this kind of “opting out” of their own country by well-off Chinese, for various reasons, also reflects inadequacies and challenges in China’s own political economy. Christine Lu: From a consumer marketing point of view, China needs to do a better job of branding itself across the board in a way that connects with the various interests of today’s global traveler. Like many tourism destinations, there are areas worth exploring that extend beyond the country’s traditional focus on famous landmarks. For those who have visited once to take an obligatory photo of themselves on the Great Wall or in front of Pudong’s skyline, what else does China have to offer on a return visit? People’s motivations for travel today are very diverse. I see an opportunity in attracting both first time and repeat visitors by focusing on niche markets. There’s a side of China that self-proclaimed “foodies” who travel to eat absolutely love. What about the art collectors who follow the emergence of China’s new creative class? How about the adventure seeker who wants to backpack around the country? China has long attracted these types of travelers by word of mouth from friends who have visited before or through independent research of travelers with a niche interest. As a result, much is written in personal blogs and articles in travel magazines if one wants to take the time to search. However, I think a better effort could be made on the part of China’s tourism sector to brand the country in a way that incorporates these niche interests into its tourism campaigns overseas.